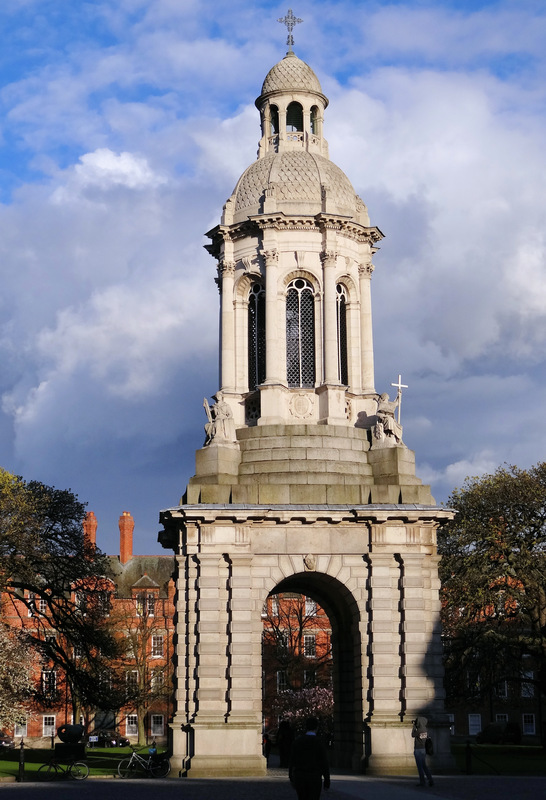 Inspired by the Vincent's Club in Oxford University and the Hawks' Club in Cambridge University, The Society of the Knights of the Campanile was founded in 1926 as Trinity College, Dublin's counterpart in Dublin University. The close relationship between the universities at the time is reflected in the Knights’ colours: dark blue representing Oxford, light blue representing Cambridge and pink representing the award for sporting excellence in Dublin. The objectives of the Society are to further the sporting activities of Trinity College Dublin, to promote the better entertainment and hospitality accorded to visiting teams, particularly those from outside Ireland, and to provide financial assistance to College students of exceptional sporting ability. Members are elected to the Society by those Knights who are currently on the books of the University with a maximum number of fifty ‘student’ Knights permitted at any one time. Sportsmen are nominated for election in recognition of their contribution to College sport in a playing or organising capacity. Other sportsmen who are of outstanding personality in the world of sport or have had a significant involvement in College sport may also be elected as Honorary Knights at the Annual General Meeting of the Society. Membership is for life and there are now over 1,200 members of the Society worldwide.